"Boats on the Open Sea"
The Boat Quilt is now finished! I thoroughly enjoyed working on this project, especially the hand stitching. I would like to make another one but would simplify the steps a little. The ocean waves were a bit fiddly to stitch. I took a long strip of the blue fabric, ironed on a strip of vliesofix, peeled off the paper backing and then cut the waves with my Wave Ruler (if you cut them with the paper still on the back, the fabric frayed up the top of each wave when you pulled the paper off). The fabric still frayed a little so if I did make another version I would not do raw edge appliqué for the waves. The actual pattern (found in an old magazine) did raw edge appliqué but used a template to cut the waves. I needed a little gift to go with the Boat Quilt. The quilt is for my little great-nephew so I wanted to make something for his big sister..... decided on the Dolly Basket. Geta's tutorial uses patchwork strips to make the bag but I only use two pieces-- one front and one back. My finished measurements were approximately 15" across X 8" down X 5" deep (base). I followed Geta's tutorial for all of the steps like handles and boxing the base and topstitching details. Geta has a neat trick that makes the bag stand up so well... check out her tutorial HERE. 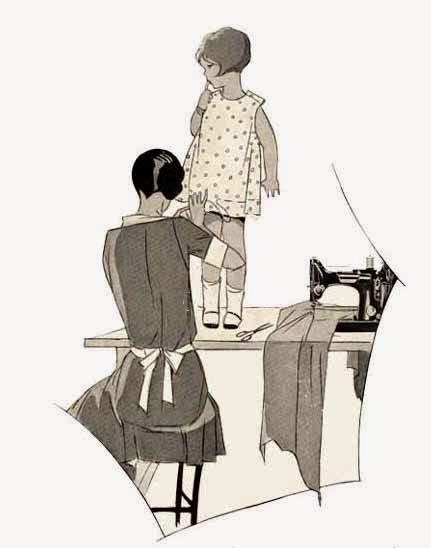 You could alter the measurements to suit smaller or larger dolls. I made this basket on my Featherweight 222K... I love sewing on this machine. I did the FMQ on it too.... such perfect stitches... front and back! I put a little pillow and quilt in the basket. The little quilt has single fold binding as there is no need for double fold binding on such a small project. I really like single fold binding, always finishes so neatly but for large quilts it's not suitable. My current project in the making is a Farm Quilt (yes, another one!). 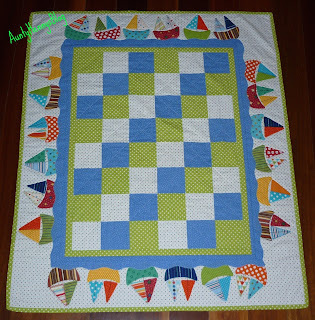 I'm making this one for my "one day I'll be a Grandmother" stash :-) I do like to have lots of hand sewing and this quilt gives me plenty. I'll be back with another Post very soon..... I've been playing with Sketchy Appliqué... and loving it! has a great trick to achieve this. fishees to keep with the sea theme. The quilt turned out wonderful, and thebasket and quilt for the blue bunny. You are so generous with all your nieces and nephews. I love seeing the projects you make for them. You always all the right touches. Those are both beautiful, Helen. I love those little boats and they are so nicely done. The doll basket is going to be perfect for his sister. Any little girl would love that. Great work. Perfect, not to mention adorable, little gifties! You are such a good Aunty! Beautiful gifts Helen, what lucky family you have! 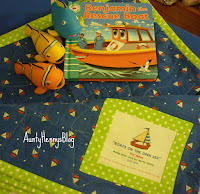 Oh, Helen, I love this quilt, specially the boats in the waves! 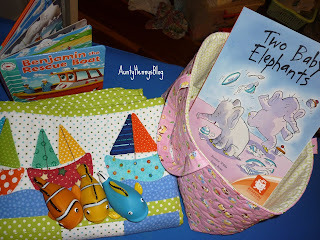 As I told you, I love the basket it makes a wonderful present for a little girl.